Rivertones, Caught by the River‘s record label, have just brought out their second release, a live recording of Robert Macfarlane and Chris Watson’s collaboration at the Port Eliot festival in July. Macfarlane narrates the account of a journey he took to Sula Sgeir, a small island 40 miles north of the Outer Hebrides. His description of the voyage adorns the beautiful sleeve by Nick Hayes. Macfarlane’s lyrical storytelling is enriched by Watson’s evocative field recordings – of waves, of water, of whale song – which fire the imagination. I found the tale of a gannet that dived into the boat particularly stirring. Hear for yourself. 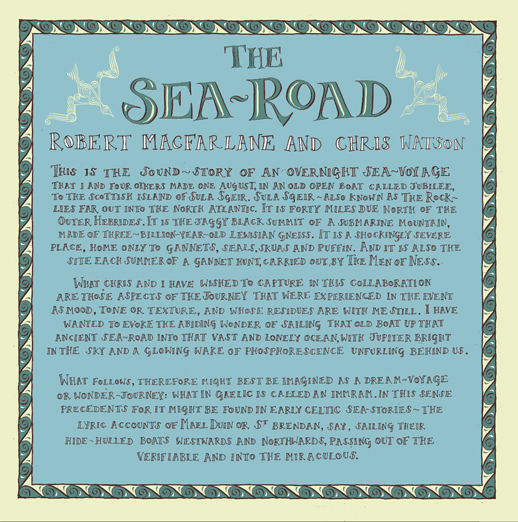 The Sea-Road is released on limited 12″ vinyl and is available in the Caught by the River shop. Every purchase will also receive the mp3s. There’s more info about the record here. I wrote about Rivertones’ first release here.